Desert Retreat - this beautiful property is within short distance of every delight and necessity. 2300 sq ft, 4 Bedroom 3 Bathroom, 3 Car Garage, Completely Remodeled & Repainted Luxury House, Quiet Neighborhood, Very bright and open floor plan, includes FREE internet access and FREE NetFlix unlimited movies. Located 2 miles from JW Marriott Resort, just 1.5 miles from the Street Fair, 1 miles to Starbucks, the grocery store, cleaners, restaurants and Bristol Farms and only 3 miles to The River entertainment center and El Paseo shopping center, you'll enjoy and appreciate this ideal location. This home has been decorated nicely and designed to be enjoyed by all, with a spacious kitchen and open floor plan. This is our home for a portion of the year and we make every effort to keep the house in perfect condition. We ask the same consideration from our renters. No smoking and No pets allowed. The house features four bedrooms, a Living Room which encompasses the kitchen, dining room, and den all in one large open room. The gourmet kitchen has granite counter tops with breakfast bar. Fully supplied with dishes, cookware, silverware and everything else you may need in a kitchen. The spacious bedrooms include a Master Bedroom/Master Bath (California King bed) with direct access to the pool area; Queen Bed in 2nd bedroom, 2 Twin beds for the 3rd bedroom and Queen Bed in 4th Bedroom and 3 full bathrooms in all. The attached casita (4th Bedroom) sleeps 2 with a full bath. All bedrooms feature high quality bedding; new furniture; ceiling fans; color TV in the Master Bedroom and Queen Bedrooms (2nd and 4th Bedrooms). The laundry room features a full size washer and dryer, ironing board and supplies. There are linens and towels for you to use during your stay. The house is fully air conditioned with two independent systems. Ceiling fans are located in every room, providing a perfect balance to the temperature both inside and out. The outdoor area is an entertainer's delight with an outdoor living room arrangement situated in a covered patio and full size barbecue. The pool and Jacuzzi, with night lighting provides the perfect setting for a desert evening. We invite you to enjoy this very special home. Monthly Rental Only. For $5500 per month. please contact property owner first for details. Pebble Tech Pool & Spa, Travertine Floors, Hardwood Floors in all bedrooms, Dish Washer, Refridgerator, Washer/Dryer, Walk-in Closet. TVs, one in living room and 3 of the 4 bedrooms. Two Central Air Conditioners, Stove & Oven, Fireplace, 3 Car Garage, Bath Linens, BBQ and outdoor seating. The gourmet kitchen fully supplied with dishes, cookware, silverware and everything else you may need in a kitchen. 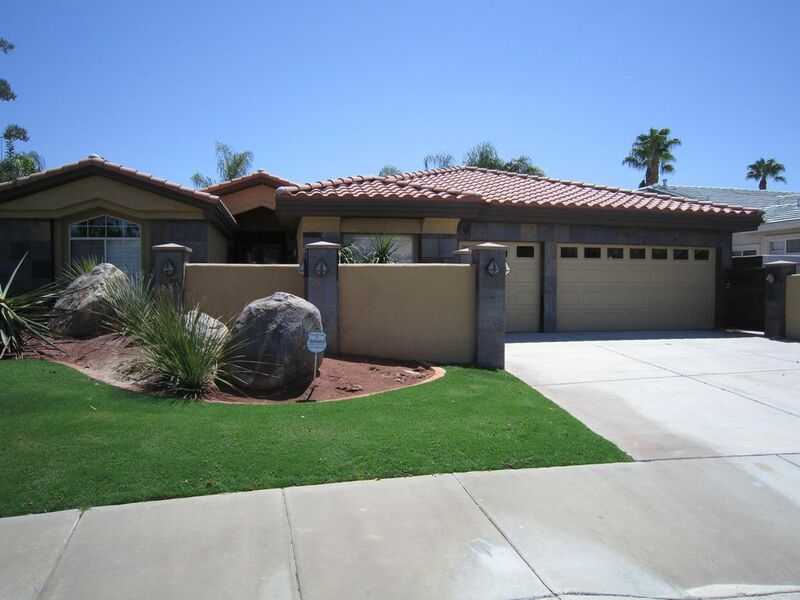 This home is large,spacious ,and immaculate with all the amenities and upgrades. All you need is a book and sunscreen. There are wonderful grocery stores close by and great shopping on El Paseo. The owner was available either text or phone throughout our stay to answer some of the questions we had. Our children and grandchildren had a wonderful Easter. I am glad you had a great time, come back and visit us again soon. This house was AMAZING. It comfortably fit all of our guests and we did not have to worry about much besides relaxing and enjoying our time. Our guests attended the Coachella Music Festival and we were right around the corner from a shuttle stop, which was perfect! The hammock, barbecue & pool provided us with much needed relaxation before and after the festival. Also, we were able to easily connect to the Wifi without any problems in order to check in on work, emails, etc when needed. Additionally, the grocery stores, coffee and restaurants were right down the road-it couldn't be a more perfect location. Andre was so helpful from the beginning of the process to the very end and transactions were so painless and easy to coordinate with Andre. He was always diligent about responding to emails, phone calls or text messages. I would definitely recommend this home to anyone (attending the festival or not). I am glad you had a great time, come visit us again soon. this home was perfect for a large multi-generation family in-gathering, we had between 4 and 8 people over nine nights, ten days and it was great space for everything. pool was a delight, there was place to hide in the shade in the heat of the day, and it proximity to good restaurants, good grocery shopping, and a short drive to the hills for hiking above the valley all made it an excellent central valley location for our getaway. Andre was very helpful with the details, this was our first time renting a home in the valley, and we wouldn't hesitate to return. I am glad you had a great time, come back and visit us again. Couldn't get my Grandkids (boy 14 & girl 11) out of the pool! Great open area together with the kitchen so we were either watching the Final 4, doing jigsaw puzzles, reading, playing cards or ......... eating! Very nice privacy for all the family, the one shared bathroom was perfect for the parents with 2 children just to keep checking up on them. The Master Bedroom was huge and just off the patio/pool. It will take a few days to figure out how to turn on the fancy shower with water coming from everywhere, but you should have such a problem! The kitchen was a part of the Family Room and had all the conveniences to do the cooking right there. We were very pleased with our 2 week stay. Small issues or questions were handled via the phone with the owner who dropped everything when we called in order to help us. The central location on Monterey was a huge plus I hadn't thought of before. But a map would have told me if you wanted to go East or West in the valley, you were close. Renting bikes allowed us to use the bike lanes for a 3 mile ride into downtown Palm Desert or to the shopping center on Country Club Dr. just 10 blocks away. Sherman's Jewish Deli is up there on Country Club too, you have to hit! Saturdays & Sundays there's a huge open-market in the College of the Desert's parking lot on Monterey just 2 miles South. Golf? Just a couple of miles is the Marriott's Desert Springs. YEA..... VacationRentals.com #87287! I was unsure making the reservations because of not having done this before. It just turned out great! I finally found a great vacation home for my yearly trip to Palm Desert with my family. I couldn't ask for any more, Andre was extremely helpful from the first day I called him. Thanks Andre! Thank You very much, I am glad you had a great time, hope to have you back again soon. El Paseo, JW Marriott Desert Resort, Many Golf Courses, McCallum Theatre, Outlet Store Shopping, The River, Spas, Fine Dining, Dancing, Concerts, warm dry weather, Westfield Mall, Movie Theaters. Close to Marriot Resort, Soak City, Groceries, beautiful Gambling Casinos, Mountain Climbing, Restaurants, Golfing, Hiking, Swimming, Swimming Pool, Biking, Water Park, Easy freeway access, 15 min drive from Palm Springs Airport, 1hr from Ontario Airport. Monthly Rate: $5500 2018 - 2019 MONTHLY RATES: January 1, 2019 - December 31, 2019: Monthly Rental Only: $5500 per month Cleaning fee: $200 Refundable security deposit $1000 Pool/Spa heating fee is base on usage (utility bills), the included utility allowance (Gas and Electricity) is $100 per month, any overages will be tenants responsibility. A $500 utility deposit is required. Credit Card Possessing Fee: A $499 fee will be added to your balance due if you are paying with credit card. Contact owner first to go over other payment options that does not require any fees.